I'm so addicted to My Beauty Diary masks.. Love the way they smell, feel, look and leave my face hydrated. By reading the name, you would expect this to smell of cherries, currants, blueberries and whatever-berry. Actually it smells like the Smint candy, Berry flavour (which happens to be my fav flavour). Almost wanted to lick the mask =_= But I'm quite positive it doesn't taste as good as it smells..
Cos I was lazy, I didn't moisturize my face for a couple of days at night. Then it was peeling and felt so dry. After leaving this on for 15 minutes and patting in the essence, flaky skin was no where to be seen! My face was brightened, super smooth and plumped up. If you look at the ingredients list below, some of the ingredients are.. So berry-licious indeed! ^_^ Can I just apply mashed fresh berries on my face? And hope no ants find out. Thanks for the great review, I love masks so I will def have to check this out! 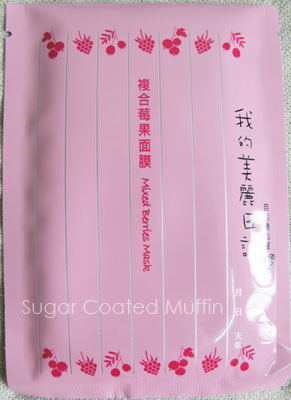 And mm- I've seen, like, 3 reviews for this particular MBD mask, and they've all been great. When I finally cave and buy some MBD masks, this will definitely be among them. <3 Thanks, like always, for the detailed and amazing review!